The Sowrays clinched another in a long line of championship successes with their first prize British Blue-cross bull calf, a five-and-half-weeks-old home-bred by the Genus dairy bull Flueron, who has been responsible for past Sowray title winners at the same venue. Out of a Holstein Friesian dairy cow, the victor progressed to secure top price in show when falling for £490 to North Lincolnshire’s Nigel and Maria Mason, now regular buyers at Skipton. The Sowrays’ reserve champion was their red rosette-winning British Blue-cross heifer, a six-week-old home-bred by the Semex sire Echo, which joined David Asquith in Poole-in-Wharfedale for £340. The brothers were responsible for all three prizewinners in the Blue heifer show class, the runner-up selling for £345 to Tony Binns, of Clint, Harrogate, their third placed entry for £290, again to Mr Asquith. To cap a good day, the Sowrays also sent out the first and second prize Limousin-cross heifer calves, which made £300 each when becoming further Asquith acquisitions. Brisk trade saw the 71 youngsters forward sell to an overall Continental-cross average of £310 per head, with a native average of £207 and a black and white mean of £91. British Blues had the best of the exchanges, with the third prize bull calf from Robert Metcalfe, of Brearton, selling well at £420 to the Masons, who also paid £400 for another Blue bull calf from Alan Middleton, of JP&KE Hartley in Beamsley. Blues also produced the leading averages, with bulls achieving £378.64 per head and heifers £294, peaking at £350 for the first prize Continental heifer stirk from Skipton regular Richard Spence, of Sutton-in-Craven. The buyer was Martin Hutchinson, of Mixenden. Mr Spence also stepped up with two further red rosette winners – the first prize Continental bull calf, a Simmental sold for £325 to Tony Binns, and the first prize black and white bull calf, which fell to Richard Umpleby in Killinghall for £95. Reigning Craven Cattle Marts Farmers of the Year Fred and Mark Houseman, who trade as Church Farm Enterprises near Burton Leonard, also achieved a hat-trick of first prize successes, dominating the native breed show classes with Aberdeen Angus entries – a bull calf sold for £265, again to Richard Umpleby, and a heifer calf that joined Paul Drinkall in Gargrave for £245. The Housemans sold a further Angus bull calf at £280 to Wetherby’s Robert Foster, along with the first prize Continental bull stirk, a British Blue-cross that became another Mason buy at £490. Robert Metcalfe was to the fore again with the first prize Limousin-cross bull calf, sold for £300 to the show judge, beef and sheep farmer Gareth Hogg, of Copgrove, Harrogate, though it was Bolton Abbey’s Graham Hayton and EC Stocks who headed both Limousin prices with a bull calf at £390, a further Mason buy, and a heifer calf at £360 to Ashield Farms, Lothersdale. 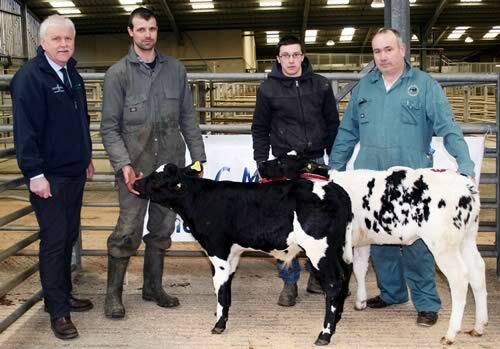 JP&KE Hartley presented the £165 top price black and white bull calf. The buyer was Dave Grassam, of Stockeld Park.